The travel tips from parents in viral tweet proves all parents are the same. The viral Twitter photo that proves all parents going on holiday are the exact same. When it comes to parents going on holiday, ‘wholesome’ is definitely not a word that springs to mind. Everyone’s parents tend to pack their bags a week in advance, and make sure they have at least a 10 hour wait at the airport before their flight just in case there’s a bit more traffic than usual. 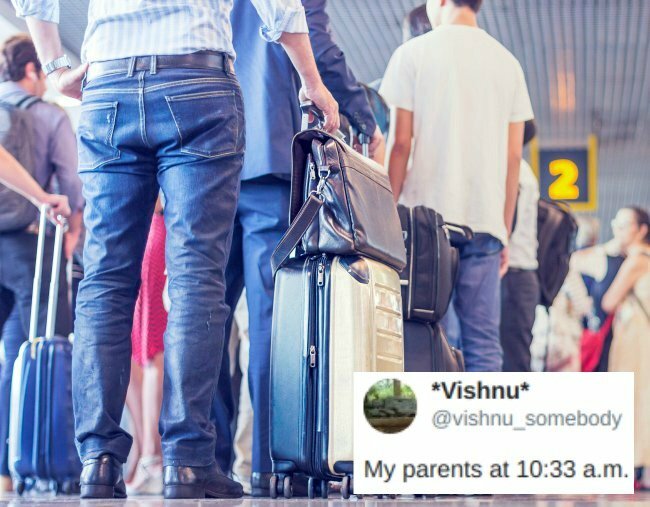 So when Twitter user @vishnu_somebody tweeted a photo of his parents sitting with their bags packed to go to the airport hours early, everyone could relate. “My parents at 10:33am for a flight at 3:10pm,” he wrote, with a photo of his parents fully packed sitting at the table. And with over 40,000 likes and 14,000 retweets, it’s safe to say that all our parents are the exact same. Naturally, the people of Twitter shared that their parents, too, are super organised when they’re travelling. But that makes complete sense! You have to be at the airport at least by 2:10pm which means you have to leave around 12:00 to beat the traffic. 12:00 is just 1.5 hrs away!! ???? All you young guys ,just wait a dacade & see what your kids write about you. It’s going to be same or even better than this. All parents (at least Indian) are same. & most of us ultimately turn out to be copy of them. My kids too laugh at me but still I enjoy it. So nostalgic???? You’ve not met Nigerian parents. They are already at the airport by 8a.m for a 3p.m flight. Same for my parens too. They love to be ready by night for next day trip to anywhere. This strategy is wonderful, save u from last min anxiety attack of leaving stuff behind. In my case, dont bother ??????? ?